.ASIA TLD fulfils a market need and a dream: market needs in a dynamically growing community, and a dream to have a unified front that improves international recognition and regional competitiveness to balance the global forces. With over 60% of the worldâ€™s population (and over 90 languages), Asia is a region that is experiencing tremendous economic, cultural and technical growth. Asia has begun to emerge from its financial and economic problems of the 1990s; at this critical juncture of rejuvenation, a special, dedicated domain can help players in the region to realize their global citizenship as well as the potential for regionally targeted efforts. 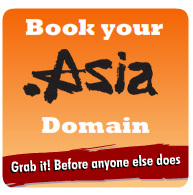 Contact us for .Asia Domain Name registration. Clik for Next page on .Asia FAQ’s.